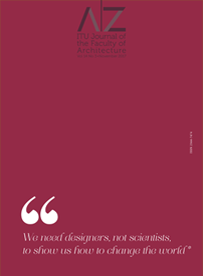 A|Z ITU Journal of the Faculty of Architecture is an OPEN ACCESS Journal. You can read, download and print full text of articles. The journal is also published with ISSN number (ISSN 1302-8324). A|Z is a refereed journal and is published as three issues in a year in English. A|Z is open to the articles and book reviews about design, planning, research, education, technology, history and art. AIM: A|Z aims to contribute to scientific research, practice and education by publishing national and international studies. AUDIENCE: Academicians, researchers, educators, designers and planners will respect to be the audience and the contributors of the journal. CONTENT: A|Z has 3 sections. Dossier section provides a current or expected to be current subject in the national or international arena. The articles are not related the subject of dossier will be published in the theory section. Articles in both sections should be accepted by referees before publication. The book review section covers the book critics in the related subjects. PAPER SUBMISSION: The articles and book reviews should be submitted to editor. The editorial board will evaluate the articles and book reviews on the suitability for the journal. Suitable papers will be evaluated by related referees. Articles could be included to publishing plan only when they are accepted by referees. Invited papers may be published in the journal.